In designing its new full-frame mirrorless system, Nikon has bowed to the inevitable and introduced a new lens mount. But not any old mount: the firm says that the fully-electronic Z-mount has the largest opening of any full-frame system, with its 55mm internal diameter able to accommodate super-fast lenses. A 16mm flange distance from lens to sensor affords extra freedom to optical designers, while a set of 11 electronic contacts enables rapid data transfer for fast, silent autofocus. Unusually the mount has four prongs rather than three; Nikon’s engineers say that this is to maintain robustness of the larger-diameter Z mount and to make lens changes quicker, as the rotation angle for mounting and dismounting them is smaller than with the F mount. Of course Nikon fully understands that it also has to appeal to its existing DSLR users, who’ll be relieved to hear that that they can use any of their F-mount lenses via the FTZ mount adapter. I’ll cover this in detail later. 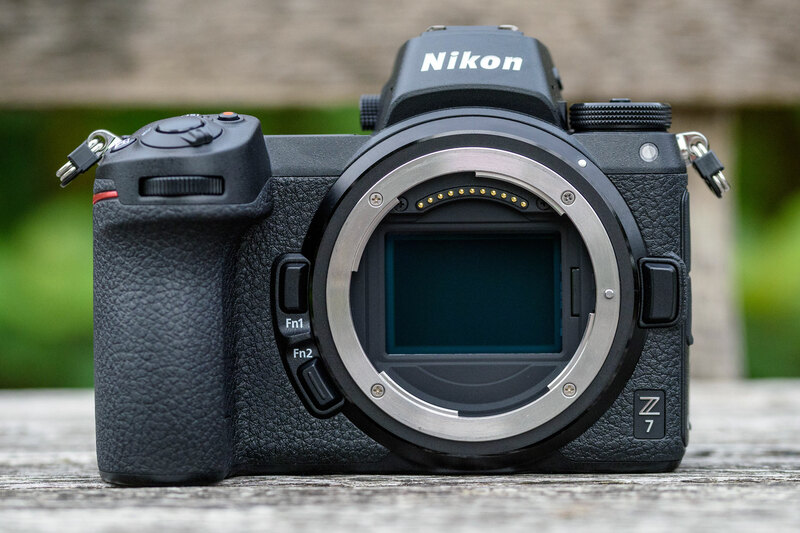 Much like Sony when it launched its Alpha 7 system, Nikon is kicking off with twin bodies that share the same physical dimensions and design, but have different sensors and core specifications. The Z 7 is the higher-spec’ed of the two, boasting a 45.7MP back-illuminated full-frame sensor with 493 phase detection AF points covering 90% of the frame area. Its standard sensitivity range of ISO 64-25,600 is expandable to ISO 32-102,400 equivalent, and with Nikon’s new EXPEED VI processing engine on board, it can shoot at up to 9 frames per second. Meanwhile the upcoming 24.5MP Z 6 will be a more affordable, general-purpose model. Shutter speeds range from 30secs to 1/8000sec, with a flash sync of 1/200 sec. An electronic first-curtain option is available which should minimise the possibility of blurring due to shutter shock, but strangely reduces the highest speed to 1/2000 sec. It’s also possible to set the camera to a silent mode which uses a fully electronic shutter, at which point the full range of speeds is available again. Unlike most other cameras, though, the electronic shutter doesn’t offer any super-fast settings. In a first for Nikon, 5-axis in-body stabilisation (IBIS) is built in, offering up to 5 stops of compensation for camera shake when shooting hand-held. Compared to the usual pitch and yaw correction that’s provided by in-lens optical stabilisation, the IBIS can additionally correct for rotation around the lens axis, which is important when shooting long exposures or hand-held video. It also corrects for left-right and up-down movements, which can have a significant impact when shooting close-ups. When you use an F-mount lens with VR, the in-body and in-lens systems work together, with the lens correcting for pitch and yaw, and the IBIS compensating for rotation around the lens axis. However it’s important to understand that all IBIS systems get increasingly ineffective with longer lenses, so don’t bank on using it to stabilize old telephoto primes longer than 300mm. 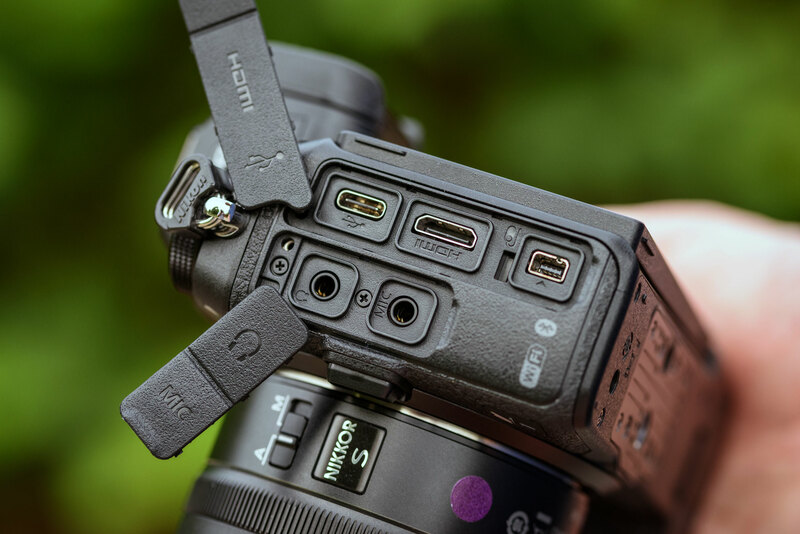 Power is provided by an updated EN-EL15b battery, which is physically the same size as that used in the firm’s high-end DSLRs, but which can now be charged in the camera via the USB-C port. 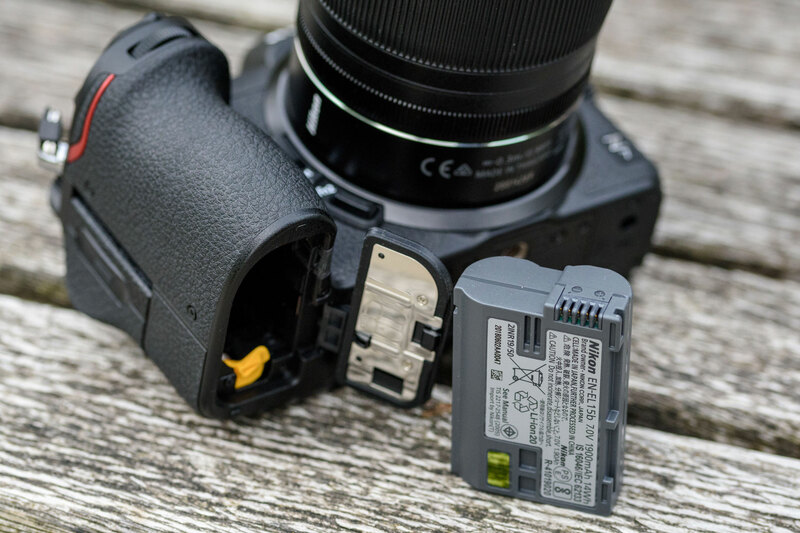 The good news for DSLR users who already own EN-EL15a batteries is that these can also be used, although they still have to be charged externally. Nikon says you can expect to shoot approximately 330 shots with a single charge, but as always with mirrorless models, in practice you’ll get many more if you shoot a lot of bursts, but fewer if you leave the camera powered on for a long time between shots. Nikon has also included a range of useful extra photographic features in the Z 7. There’s an Interval timer shooting mode, a Time-lapse movie setting that will make 4K or Full HD movies in-camera, and Focus shift shooting that facilitates stacking in order to achieve maximum image detail. This provides some handy extra abilities compared to the somewhat spartan Sony A7R III. On the side of the camera you’ll find a full set of connection ports. They’re arranged much more sensibly than the latest-generation Sonys, with both audio connectors placed behind the same cover, which even folds up so you can plug in a microphone while keeping the headphone socket protected. Beside them, another folding cover lets you use an electronic cable release without revealing the HDMI and USB-C sockets. When it comes to video, 4K recording is available at 30 frames per second, alongside Full HD at up to 120fps. Peaking and zebra pattern displays can be used to judge focus and exposure, while VR and Active D-Lighting are both available in 4K UHD. 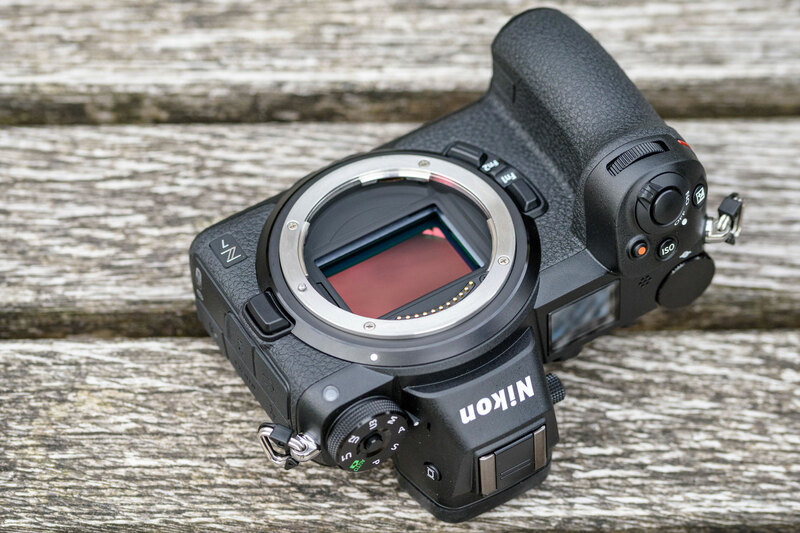 More good news for videographers is that the autofocus speed and tracking sensitivity can be adjusted during recording, and 10-bit footage can be output over HDMI using a flat N-log profile. The camera will sync with equipment that supports Atomos Open Protocol in 4K UHD, and Timecode output makes it easy to synchronise recorded footage. Both Wi-Fi and Bluetooth connectivity are built-in, and Nikon says it’s included a dedicated processor that should provide a more stable connection to devices running its SnapBridge app. The Wi-Fi isn’t exclusively tied to SnapBridge any more, either, which means that in principle the camera should work with third-party Wi-Fi control apps. When Snapbridge first appeared a couple of years ago it was pretty awful, but now at version 2.5, it’s very much improved. It allows you to establish an always-on Bluetooth LE connection between the camera and your phone, which enables every single picture you shoot to be automatically transferred to your phone. The idea is that you can then browse through them and share your favourites just as easily as if you’d shot them on your phone in the first place. This auto link feature worked perfectly well with both my Samsung Galaxy Tab S tablet and my iPhone SE, just as long as Snapbridge was running in the background. However with my Huawei P20 Pro it simply didn’t function at all unless the app was open in the foreground, and even then it was erratic. If like me you don’t want to clutter up your phone like this, but instead only want to transfer a select few images, then this is also on offer. For this purpose SnapBridge works absolutely fine, and because you no longer have to pair devices using Bluetooth first, it at last behaves sensibly if you want to switch between a smartphone and a tablet. You can also use your phone to control the camera over Wi-Fi, complete with a live view display and the ability to set the key exposure parameters remotely. This works perfectly OK, although there’s a brief lag between pressing the shutter button on the app and the picture being taken. However there’s no quick-and-easy Bluetooth remote option, as is offered by both Canon and Panasonic. To go with the Z 7, Nikon has released three native Z-mount lenses. The 24-70mm f/4 S and 35mm f/1.8 S are available immediately for £999 and £849 respectively, while the 50mm f/1.8 S (£599) will go on sale in a month or two. 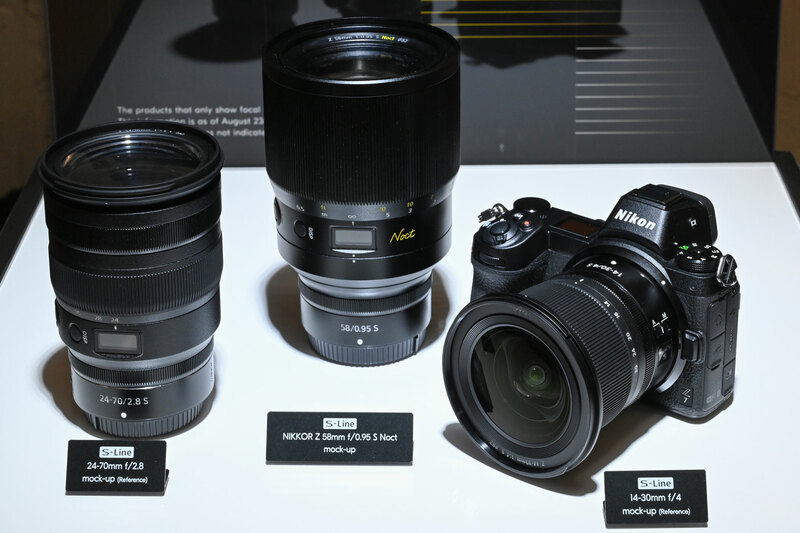 Nikon has also published a roadmap of upcoming lenses. In 2019 we can expect a further six lenses, including a 58mm f/0.95 S Noct, 20mm f/1.8, 24-70mm f/2.8, 85mm f/1.8, 70-200mm f/2.8 and 14-30mm f/4. By 2020 Nikon is hoping to have twelve optics in the lineup, adding a 50mm f/1.2, 24mm f/1.8 and 12-24mm f/2.8. Nikon has shown mockups of some of these lenses: as you can see above, the 58mm f/0.95 Noct will be absolutely huge (it’s also slated to be manual-focus only). At the other end of the scale, the 14-30mm f/4 is remarkably compact (which is a direct advantage of the mirrorless design), and if it’s delivered in this form, looks like it should be a fantastic option for wideangle users.